Here we are at the end of February, and as promised, I am giving away another vignette. Everything you see here was designed, or redesigned by me. Here is GIVEAWAY #6. The winner will receive this vignette, which includes: A redesigned box, bottle, two tags, vintage towel, and pillow. 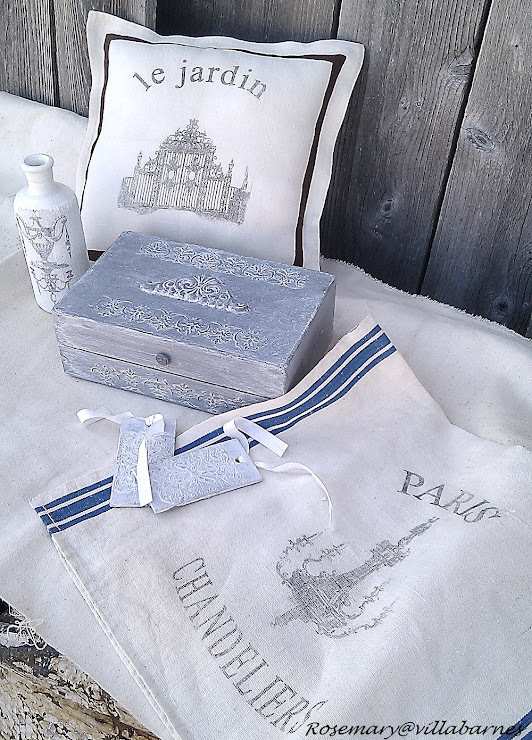 The box was hand painted by me, with a dimensional design, and applique. A numbered tack was added. 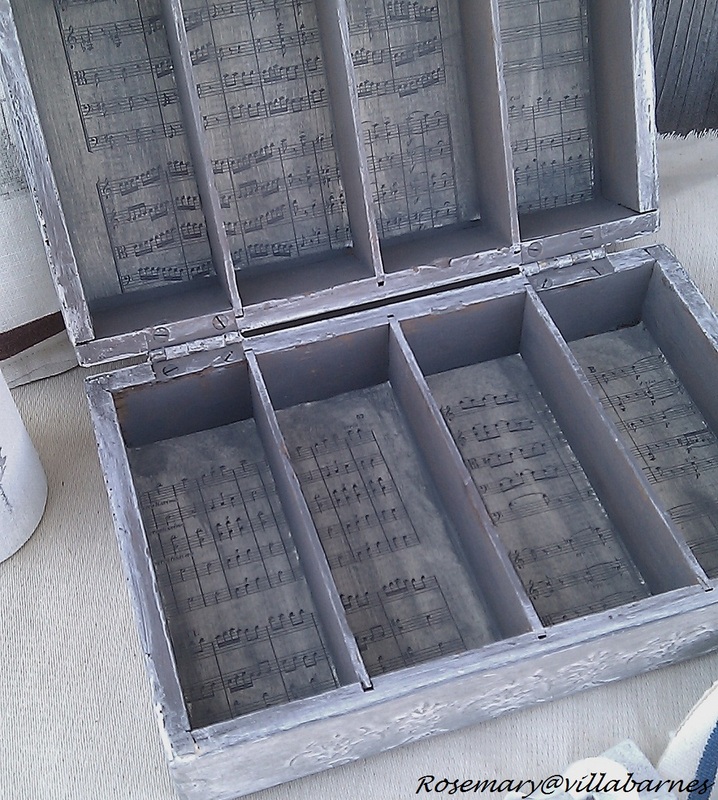 The inside was altered as well, with vintage sheet music. I altered the bottle with paint, material, and a vintage image. 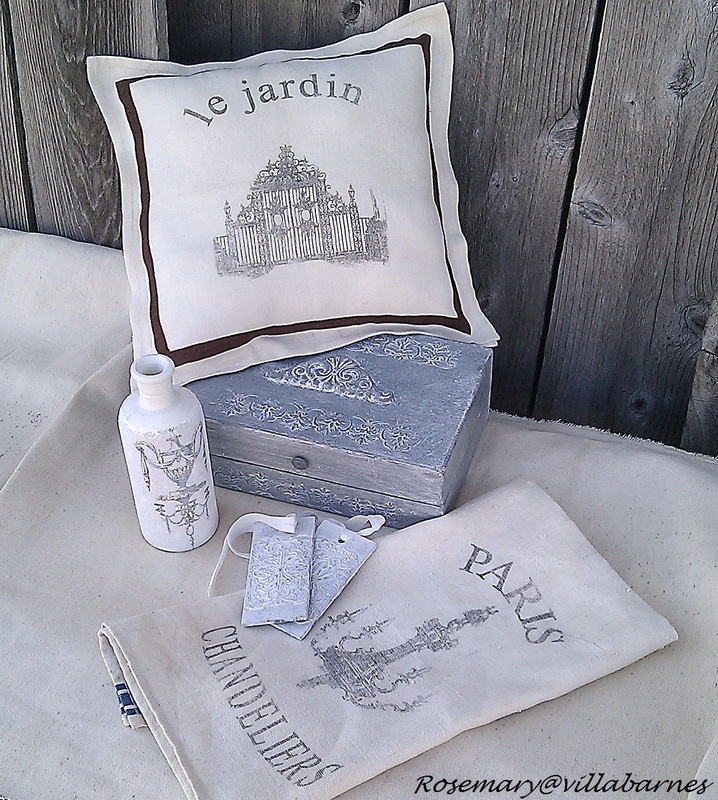 I made the pillow with two vintage linen napkins, and a transfer design. The vintage linen tea towel has a different transfer design, which I created with a vintage image and added lettering. The wooden tags were altered with dimensional paint. Ribbons have been attached. I am getting ready for my first show of the year, so this giveaway will close a little earlier than the previous ones. My favorite is the box, but it is all beautiful. I'm a follower. Love your stuff! What a beautiful giveaway! Enter me please! I too have a giveaway going on right now. Please stop in and sign up! I'm already a follower of yours. for one more chance at your lovely giveaway! Thank you! Im a follower & would love to win. I Think this is your best vignette yet. I'm already a Google Friends follower! and I follow on Linky Followers, too. You know I follow you!! Wonderful giveaway as usual! I'm also a linky follower! Just published your giveaway on my blog - end of my Saturday post! Thanks for the opportunity, Rosemary! Beautiful vignette! I am a follower! How beautiful! I would love to be entered...I am a follower. And now that I see you are not a blogger blog I am also a Linky follower! I am a follower please enter me! Following you with the linky thing. Following you so with gfc as well. Hopefully I will win that gorgeous box. Rosemary you make the prettiest shabby decor. I am already a GFC follower. Beautiful giveaway Rosemary, plese enter me. I follow you on Linky followers and GFC. I'm already a very happy follower! I would LOVE to be entered in your drawing, Thank You for the opportunity! Girl, you are the Queen of giveaways! I have posted your giveaway on my personal FB page. I'm now a Linky follower! You're on my Facebook page! Ive been your follower sweet Rosemary and I'm coming to participate on your new and generous giveaway. Please count me in. Have a nice Sunday. Hi, Rosemary! I'm a follower. I'm a follower & I would Love to win this vingette! I just joined Linky and I am following you. Love it all! I am also following on Linky! I'm also your Linky follower! I am already an avid follower and am over the moon excited to be entered into your fabulous giveaway! Thanks for offering these scrumptious goodies! I'll be keeping my fingers crossed. P.S. And I'm always in awe of all your incredible transformations! I do want to be entered. What great things. I am following you through LInky. As with the previous giveaways, this is a lovely and generous giveaway, Rosemary! I have to tell you that this grey you do goes so well in my guest bedroom. That is where I put my giveaway win items and they look great in there! Your work is amazing! I'm a follower! I would love to win. I'm a follower. 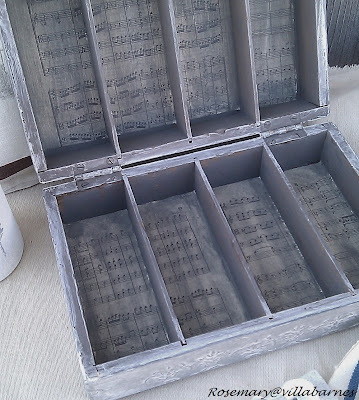 Love the box you have made Rosemary! Gorgeous! I have been a fan and a follower for almost a year! Such lovely gifts. You are so talented. I just followed your blog and entered my email address so I receive your blog post via email! Thank you! Count me in, Rosemary, these are fabulous. You are soooo generous, Rosemary! I would love to enter...good luck everyone! Another gorgeous giveaway! Please include me. I follow you on linky link! Ah...another exciting giveaway. Yay! Please enter me for a chance to win. Everything is so pretty and has your special touch. I am already a linky follower too. Love this giveaway! You always come up with the best things! You know I am already a follower! .....and I am already a follower on your linky tool, too! Rosemary, I'm now following you with Linky Followers and I'd love to win this vignette. I have been a follower of your blog for some time now. Oh my goodness! I LOVE LOVE this even more that your last one! How wonderful it would be to have these things in my own home! You are such a generous soul... thank you for the opportunity to win your wonderful treasures. Oh, pick me. I am a happy follower on both GFC and Linky. I love what you giveaway Rosemary...so beautiful and to know that it was habdcrafted by you makes it even more special a gift. I am already a follower! And I am already a Linky Follower!!! Proud follower. I would love to win your lovely items! I was already a follower of villabarnes. I'm a new follower of your blog and I would love to win this lovely vignette! 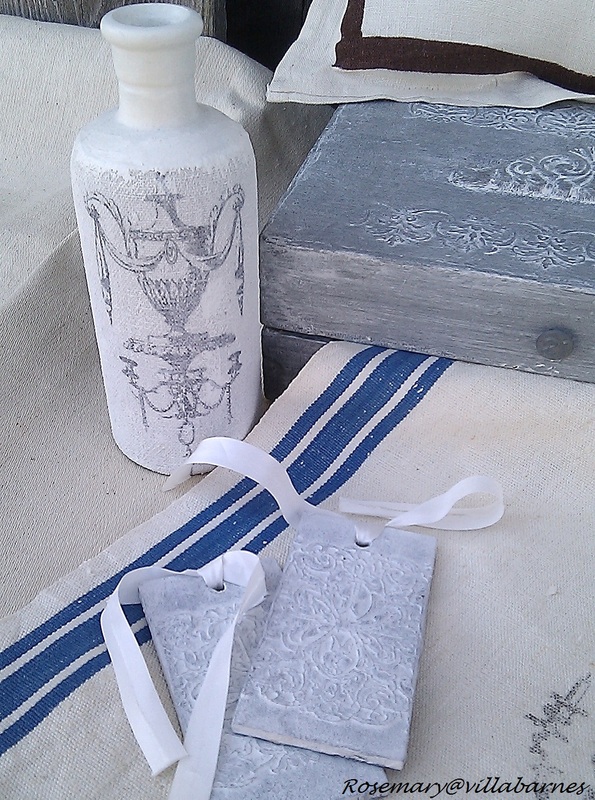 I'm a new Linky follower too and would love to win your gorgeous creations. Thanks so much for the opportunity! Love the giveaway and actually everything you do!!! I am a follower and became a follower on linky followers. I'd love to win your beautiful vignette. Thanks. I follow your blog. Rosemary, everything is just beautiful. Absolutely love the darling box, beautiful towels and tags. I think the tags are my favorite. Love how you are using the dimensional paint. The pillow is gorgeous! Just found your blog and I'm now a happy follower. I am already a follower and would love to enter the giveaway! I am a follower and would love to win a creation by Rosemary! I also follow you via Linky! You are so generous with your goodies! I would love to win! I am a follower! I follow on Linky Connect as well! I have posted about your giveaway on my sidebar! As always everything you do is fabulous and I would love to win this give away and I am already a follower. Rosemary, your work is gorgeous! I would be thrilled to win. I am going to share on my FB page too. I am a follower and I would LOVE to win!!! Please enter my name. Maybe this is the one for me to win!!! LOVE that little box. I posted on my blog about it. I would love to enter...you are so talented, I am not. so anything that is made like the things you make, would be an added specialty to my various collections. heck, I would love to win!!! well thank you. Rosemary, I am definitely a follower! I have been admiring that vignette you are giving away, so please count me in! I'm a follower and would LOVE to win!!! i have just found you and love the way you have made these pieces. i am following you. thank you for the chance to win! your wonderful giveaway is on my sidebar! thanks for another chance! i obviously won't want to miss a chance to win (too bad i don't do facebook). What a great giveaway!I just knew I was a follower but when I went to sign it it signed me up instead so now I am! I am a follower right now and like your wonderfull Giveaways. I'm already your follower and I'd like to enter your nice giveaway! I'm following you on Linky as well! Holy cow are you popular. I love your work and I am now a follower. Keep up the great inspiration. I share the giveaway on facebook. I am now a follower, even though I've been reading your blog for awhile now. Thanks for the chance to win some beautiful items. I am a follower, please enter me for these lovely treasures. I'm already a Linky follower, too. I don't want to miss anything! I shared your giveaway on my FB page, too. I am already a follower and love your blog! This giveaway is adorable! Oh, how I would LOVE to win this from you! Gorgeous work!! I am already a follower of yours!! I have posted this on my blog's Candy Corner! Beautiful giveaway again!!! I am a follower and a Fan!!! I would love to be entered to win....many thanks! Hello - I am a follower and became one a month or so ago. I would love to be in your drawing! Almost forgot to put my name in the hat! I am putting an additional one in as I am also a Linky Follower! Your work is so beautiful and I would be honored to win! I would love to win the lovely items you are giving away. I am a follower.